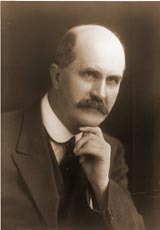 William Henry Bragg was elected a minor scholar of Trinity College, Cambridge, in 1881 and studied mathematics under Dr E. J. Routh. He studied physics in the Cavendish Laboratory during part of 1885, and at the end of that year was elected to the Professorship of Mathematics and Physics in the University of Adelaide, South Australia, where his research interests included the ionization of gases and the the ionization curve of radium. He subsequently became successively Cavendish Professor of Physics at Leeds (1909-1915), during which time he invented the X-ray spectrometer, Quain Professor of Physics at University College London (1915-1925) and Fullerian Professor of Chemistry in the Royal Institution. While Quain Professor at London, he continued his work on crystal analysis. During the First World War, Bragg was put in charge of research on the detection and measurement of underwater sounds in connection with the location of submarines.